One-Armed Swordsman is a 1967 Hong Kong wuxia film produced by the Shaw Brothers Studio. Directed by Chang Cheh, it was the first of the new style of wuxia films emphasizing male anti-heroes, violent swordplay and heavy bloodletting. It was the first Hong Kong film to make HK$1 million at the local box office, propelling its star Jimmy Wang to super stardom. This film eventually becomes the first in the One-Armed Swordsman trilogy. 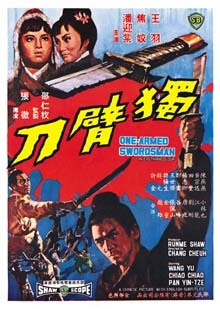 A sequel was released in 1969 called Return of the One-Armed Swordsman, followed by The New One-Armed Swordsman in 1971, all directed by Chang Cheh. It has since achieved classic status in Hong Kong cinema. In the Hong Kong Film Award's 2005 poll, One-Armed Swordsman was voted as the 15th best Chinese language film. The Golden Sword school is attacked by bandits. The servant Fang Cheng sacrifices his life to protect his master Qi Ru Feng. In gratitude, Qi accepts the dying Fang Cheng's son, Fang Kang, as his student. Years later, Fang Kang is scorned by his snobbish fellow students because of his poor background. Deciding that he will only cause trouble for his master Fang Kang leaves the school only to run into his classmates and his master's spoiled daughter, Pei Er. In the ensuing fight Fang's right arm is cut off by Pei Er, who is angry at his indifference towards her. Stumbling away, Fang falls off a bridge into the passing boat of a peasant girl Xiao Man. Xiao Man nurses him back to health and the two fall in love. Fang Kang is nevertheless depressed as he is unable to practice his swordsmanship. Reluctantly, Xiao Man gives him a half-burnt kung-fu manual which she had inherited from her now dead parents. With its help, Fang Kang is able to master a new one-armed style of swordplay, making him stronger than before. Meanwhile, master Qi Ru Feng is preparing for his 55th birthday and has invited all of his students to the celebration to choose a successor from amongst them so that he can retire from the martial arts world. However, his old enemies the Long-armed Devil and the Smiling Tiger Cheng are taking the opportunity to destroy Qi Ru Feng. Using a specially designed "sword-lock", they ambush and kill Qi's students travelling to the celebration. Fang Kang inadvertently learns of the plot and, breaking his promise to Xiao Man not to involve himself in the martial arts world, rushes to save his master. He is delayed en route by the Long Armed Devil's accomplices and when he arrives the Long Armed Devil has already killed most of the students and wounded Qi Ru Feng. In a vicious battle, Fang Kang manages to kill the Long Armed Devil, but chooses to return to Xiao Man and become a farmer, instead of taking his master's place at the school. This page was last edited on 21 April 2019, at 10:29 (UTC).